Legendary Wales fly-half Barry John has spoken after deciding to sell many mementos of his glittering international career. John admitted that he had not room for nostalgia and that the honour of playing for Wales was the most important aspect of his career. Known to many Welsh fans simply as "The King", John has decided to auction items including his first Welsh cap, his jersey from his final appearance for Wales against France in 1972 and a British and Irish Lions shirt from their only series win in New Zealand in 1971. The items will be auctioned by Bonham's in Chester on February 25. "I saw that former footballers including Geoff Hurst had put their memorabilia up for auction and I saw one or two rugby players doing it," John told The Western Mail. "I spoke to Jan [his ex-wife] and my four children about it. I asked Jan if she knew where my Welsh cap was and she said: 'It's in a drawer upstairs - somewhere'. "I talked to two great friends of mine - I won't say who but one is a former Lion - and asked what they would think if I did it. I thought there might be something wrong with doing it. But they said, 'Do it'. "I spoke to my children and thought about what I could leave to them. I've got four children and nine grandchildren but I only played 25 times for Wales so I haven't got enough to go round. "In an ideal world I would like to see all of them go to a museum. It's far better than being in a 'drawer upstairs'. I hope they go to a good place." John also maintained that he felt no guilt or nostalgia in handing over his memorabilia, citing the change to professionalism as another reason. "Friends have asked about nostalgia and, amazingly, there isn't any," he said. "Playing for Wales is the greatest thing to happen to any sportsman but I don't feel that much nostalgia. When I handed them over, I just didn't get that gut feeling. I felt it was the right thing. Why take them to your grave? "Since 1996, when rugby turned professional, all of us look at the world in a more professional manner. The amateur ethos has gone." "Why have something languishing at the bottom of a drawer if it can be shared with other people?" 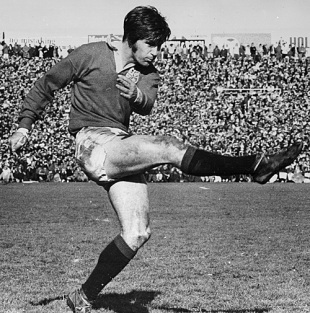 During a short, but spectacular, international career John won praise as one of the most gifted and expressive fly-halves in the world game, winning 25 caps for Wales and sending the Lions to victory over the All Blacks in 1971. He retired unexpectedly in 1972, citing "the monster of fame" as his reason, with world rugby losing one of its genuine superstars and most gifted players.